Five bold predictions for the NHL Western Conference next season. With the new NHL season just around the corner, we should expect a year full of surprises. Several teams might climb the standings, meanwhile others might take a step back in 2018/19. In the spirit of the new NHL campaign, let’s have some fun and make five bold predictions in the Western Conference this upcoming season. The Vegas Golden Knights had a historic season in 2017/18 and coming into this season many expect them to be a contender in the Western Conference. However, living up to last year’s miraculous run will be a tall order. They were three games away from winning the Stanley Cup so no teams will take them lightly anymore. They also lost several keys players like James Neal and David Perron in free agency and Jason Garrison is still unsigned. The combination of these things may prompt the Golden Knights to come back down to earth. As we have seen in the past, the Western Conference can be a bit unpredictable. As teams like the Edmonton Oilers, Chicago Blackhawks, and Calgary Flames made the playoffs in 2017, they were still battling for the lottery pick in 2018. At the same time, teams like the St. Louis Blues, Colorado Avalanche, Nashville Predators and Winnipeg Jets are all getting better. 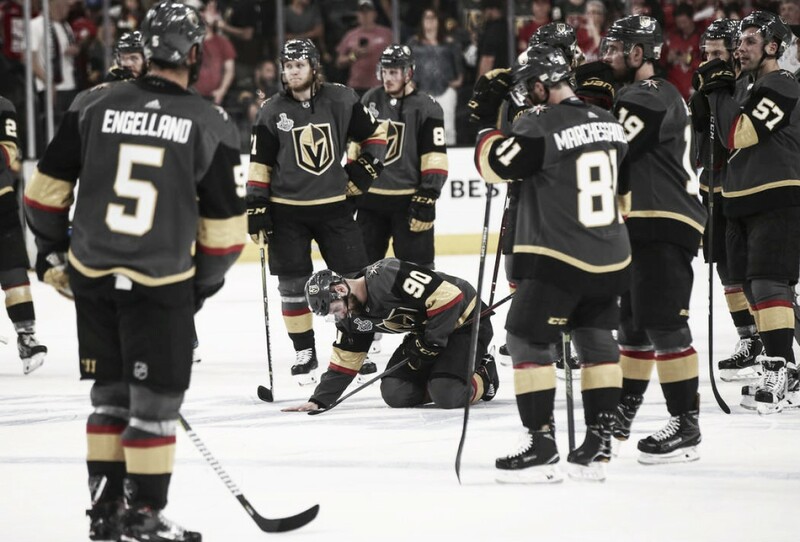 The West is very competitive and the Golden Knights might not have the depth or the firepower to be as successful as they were in their inaugural campaign. Prediction: The Vegas Golden Knights will miss the playoffs... what's the odds of that? In 2017/18 we saw the Chicago Blackhawks free-fall to the bottom of the Central Division and finishing six points ahead of the last place Arizona Coyotes in the West. They missed the playoffs for the first time in nine years, and it’s fair to say this team is a far cry from the Cup contending team they were a few years ago. Due to cap budget constraints, the team wasn’t able to do much to improve their team in the off-season either and will be banking on a lot of unproven talent to put them back into the playoffs. All things indicate that this team will continue to decline, and when things don’t go well, firing the coach is usually the easiest thing for a team to do. That's not a knock on coach Quenneville as he is a proven winner, but that’s part of the business and coaches are usually the first scapegoat. Prediction: Joel Quenneville will no longer be the Blackhawks’ head coach after next season. The St. Louis Blues got a lot better this summer. They made a blockbuster deal that helped them acquire Ryan O'Reilly. They were also able to solidify their forward depth by bringing in proven veterans like Patrick Maroon, David Perron, and Tyler Bozak. Forward prospects Robert Thomas and Jordan Kyrou are looking to break into the lineup this year and Robbi Frabbi is expected to be healthy this year. On paper, there is a lot to like about this new facelift, and we can’t forget about the solid team they have still in place which features Alexander Pietrangelo, Colton Parayko, Jaden Schwartz, Vladimir Tarasenko, and Brayden Schenn. There is a lot to like about this team heading into 2018/19. On paper, it looks like they have enough firepower to compete with the best teams in the Western Conference and have a chance to be a top-three team in the Central. Prediction: St. Louis will win the Central Division. Yes! The Arizona Coyotes finished last in the Western Conference in 2018! But if you watched any of their games, especially later on in the season, they seemed to have turned things around significantly. The Coyotes put together a respectable 17-12-3 record in their final 32 games. If last year was any indication, it shows that they can be a .500 team if they are able to stay consistent more often. GM John Chayka was busy this summer, he acquired another proven scorer in Alex Galchenyuk and also added a promising up-and-coming talent in Vinnie Hinostroza. With another year of experience, their younger players (Clayton Keller, Christian Dvorak, Christian Fischer, and Brendan Perlini) should continue to improve and contribute more to the team next season. We saw a team like the Colorado Avalanche rise from the basement of the West to a playoff spot in 2018. So there is no reason, the Arizona Coyotes can’t be that team next year. We are not saying that they will go on a deep playoff run but a wild-card playoff spot could be a possibility. Prediction: The Arizona Coyotes will make the playoffs. Coming into 2018/19, most of the rookie-hype is around players like Rasmus Dahlin, Casey Mittelstadt, Andrei Svechnikov, and Eeli Tolvanen. Who are all high-end prospects and have a legitimate shot to win the Calder Trophy. As a result, a lot of people are sleeping on a player like Elias Pettersson who was the fifth overall pick of the Vancouver Canucks back in the 2017 NHL draft. Some people may not realize this, but Petterson is one of the most NHL-ready prospects outside of the NHL. The 19-year-old has been playing professional hockey against men for three years and was the MVP of the SHL last season. With the Sedins gone, Pettersson will likely be given top minutes right away. The crafty Swede has proven that he can score (56 points, in 44 games in the SHL) and is expected to be a major contributor in Vancouver next season. If he gets an opportunity to play with an elite finisher like Brock Boeser, it may give him the edge he needs to capture the Calder Trophy in 2019! Prediction: Elias Pettersson will win the Calder Trophy. Who do you think of these bold predictions? Let us know in the comment section below and be sure to give us a follow on Twitter by searching (VAVELNHL_ENG).